There really is a guy called Sam who started the company, and yes he regrets calling the company after himself every single day. We’re building next-generation performance tests to help build a better, faster, smoother future internet for everyone. Our products are used by internet users, service providers, government regulators, hardware manufacturers, and content providers. This year we improved our products and launched exciting new projects and got a dog called Sausage. We proudly opened two new internet measurement projects with the Australian and New Zealand regulators. Both projects are set to continue for the next three years, with the regulators using the data to increase transparency, direct policies, and invest in internet infrastructure. Our SamKnows engineers designed a prototype Whitebox capable of measuring 10Gbps. We developed metrics for three online storage services – Dropbox, Google Drive, and Microsoft Office 365 SharePoint – and put them to the test to see how well they performed. We’re always improving our products. This time, we tightened our test scheduling and trigger tests so that an ISP can run any test at any time, created specifically to help ISPs improve their customer care. The SamKnows Android team also developed a short-term solution to help emergency response teams track and restore internet infrastructure quickly and efficiently in the aftermath of a natural disaster. Continuing with the theme of the “new”, we engaged in new project collaborations, regulator projects, and hired even more employees. We entered some exciting integrations with Broadcom and Qualcomm to leverage hardware acceleration and create tests that could measure speeds greater than 1Gbps. Our Client Services team opened Meqyas, the first SamKnows project in the Middle East, measuring fixed and mobile internet services. eero, the world’s leading company to deliver fast and secure Wi-Fi throughout your home, worked with us to integrate all their performance data into SamKnows One. It goes without saying that building the best internet performance measurement platform available requires the very best team of developers. Our development and engineering teams are seriously strong. But the hires haven’t stopped there – our Creative, Customer Service, Client Service, and Finance teams also welcomed new team members to the office as well, to great effect. ...was all about the “new” – a new office, a new Whitebox, and a new data and analytics platform. Phew. Another major development: we launched the Whitebox 8.0, measuring up to 1Gbps speeds. Less expensive but still providing accurate results, the new Whitebox was a hit. Our data storage was fit to burst. We were speedily embedding our Router SDK into the routers of some very large ISPs, along with the wireless access points of major mesh network vendors. And did we mention the data collected by our new mobile SDKs and Rapid Build Framework apps for Android and iOS?! With the expansion of the number of measurement agents rising from between 2,000 and 15,000 per account, to millions, it was time to scale-up our data platform. Say hello to SamKnows One. With box-set binges dominating the internet, we developed a suite of video-streaming metrics. We started out with YouTube, closely followed by BBC iPlayer, Hulu, and Netflix. Anticipating even more hires, we moved to a larger office on the South Bank of London. Beautiful. Client services racked up their air miles in 2015, securing new government contracts in the far-flung corners of the globe. SamKnows opened a project with Mongolia’s CRC to monitor network performance, on fixed and mobile internet. SamKnows kept a handy tally of Brunei’s fixed internet speeds. Australia launched its pilot study, focusing on fixed-line internet performance as well. Leading Canadian ISPs gathered together and pledged to support SamKnows’ efforts to measure their internet performance. Further collaboration with regulators and ISPs worldwide. We started working with leading UK ISPs to create the Quality of Experience benchmark. Hong Kong regulator, OFCA, used a reference-number system that meant consumers could check their specific speeds. SamKnows could now check network performance against the Quality of Experience benchmarks. The Canadian Radio-television and Telecommunications Commission (CRTC) produced a broadband national standard, and looked to publish a consumer report on the state of Canada’s internet. A large European ISP accepted the Router SDK and the proof of concept was approved. SamKnows develops a range of products and testing agents. Level3 provided SamKnows with access to many servers around the world to test against. By now, we were generating a huge amount of data. In fact, the immortal words ‘Big data’ didn’t nearly do justice – we were talking about absolutely massive data. The FCC expanded Measuring Broadband America to include mobile performance testing. US citizens could now track their mobile and fixed internet performance. SamKnows hired more developers and account managers to cater for the fast-growing list of clients and performance results. 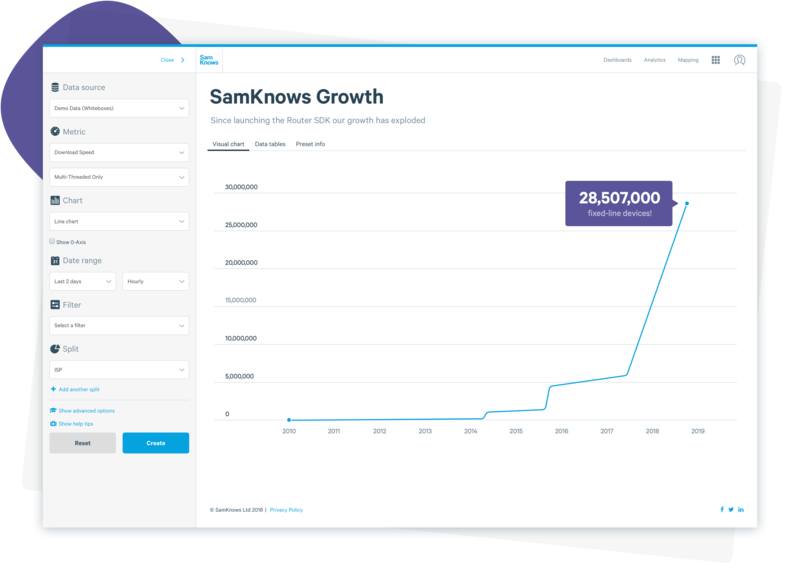 SamKnows launched operational dashboards that were tailored to ISP requirements, and visualised all their performance data in charts and summary tables for meaningful analysis. Available for iOS and Android – it was now possible to measure your smartphone’s internet connection. SamKnows launched the Mobile Whitebox to measure mobile broadband via a dongle. We also released the new SamKnows web-based speed test. But we weren’t done yet… another major addition to the SamKnows toolbox was the Router SDK, available for ISPs to embed directly into their existing in-home routers. This was a big step towards fulfilling our dream to record performance levels from every router, in every home, helping to improve the internet for every user. SamKnows became the standard for measuring broadband in Brazil. Toca aqui! SamKnows launched its new Whitebox, capable of measuring speeds up to 200Mbps. The European Commission appointed SamKnows to start measuring fixed internet across the European Union. The IMDA hired SamKnows to measure their fixed-line internet. Ap Kabar! Welcome! SamKnows was now considered the world-leading authority on measuring the internet. SamKnows opened its first office and gathered like-minded people for the mission ahead. The second-generation Whitebox was released, in partnership with Netgear. No more duct tape; more technical innovation. The Federal Communications Commission launch Measuring Broadband America in the United States. M-Lab, supporters of an open internet for all, provided Measuring Broadband America with independent test servers, free of charge. Pretty soon, other regulators and ISPs from all over the world came knocking, seeking SamKnows’ help to measure their internet performance. The company continued to grow. Ofcom, the UK’s internet regulator, were thrilled – “We’ve been trying to do this for years” they said. For the first time, Ofcom could easily and accurately measure and compare the performance of UK ISPs. Sam published a notice on The Register to ask if anyone would like to help him conduct a national study of the UK’s internet performance. The response was staggering. “Might be on to something here!”, he thought. Sam Crawford, a young software developer, dissatisfied with the available web-based speed tests, set about building the most accurate internet measurement solution in the world. Sam quickly realised that the only way to accurately measure internet performance is from inside the home, using hardware that’s connected directly to the router, running tests 24/7. This would remove any interfering factors, such as cross-traffic and weak Wi-Fi, that would otherwise degrade the accuracy of the measurements. Armed with a soldering iron, a roll of duct tape, and a bunch of electronic bits and bobs he bought on eBay, Sam set about building his first proto-type router, which he embedded with his first network tests. He then published his first internet performance report and shared the data with the world. The industry took notice. ISPs were excited to use accurate, third-party data to help them see what was going on, both inside and outside of their networks. Alex Salter (CEO), and Neil Campbell (COO) joined the fold and helped Sam turn his idea into a successful business. Find out the latest in the SamKnows story over on the SamKnows Megablog.